Center Jonathan Toews scored the only goal in the shootout, giving the Blackhawks a 4-3 victory. 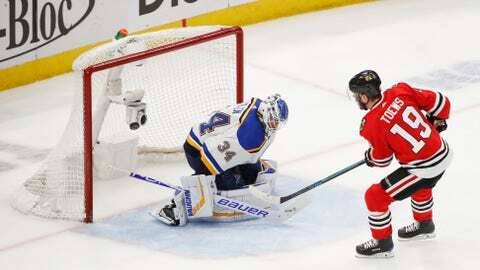 CHICAGO — Despite staging a late comeback against the Chicago Blackhawks, the St. Louis Blues are still a point shy as they tried to climb into a tie for first place in the Central Division. Cam Ward stopped Bozak’s point-blank first deflection of Patrick Maroon‘s pass from left wing, but Bozak jammed in a second attempt. The goal withstood a video review for goaltender interference. NOTES: The Central Division rivals met for the fifth and final time this season, but for the first time since Nov. 14, 2018. … Blackhawks D Dennis Gilbert made his NHL debut after being recalled from Rockford of the AHL on Wednesday. … Kahun returned after missing a game with a facial injury. … The Blackhawks honored Hall of Fame brothers Tony and Phil Esposito with a “One More Shift” salute before the game. Both skated on to the ice and joined their former team during the national anthem. Tony Esposito debuted with the Blackhawks as a Calder Trophy winner in 1969-70 following a trade from Montreal and tended goal for Chicago for 15 seasons. Phil Esposito played his first four seasons in Chicago before being traded to Boston where he led in the NHL in goal scoring over six straight seasons.